By Vincent Morgan	| Published on Thursday, December 3, 2009. 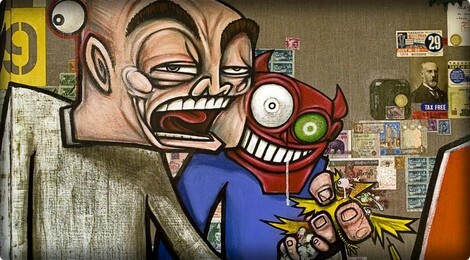 Graffiti Gone Global, presented by SUSHISAMBA, will take place December 4-6th, 2009 during Art Basel Miami Beach. Curated by James and Karla Murray, authors of best-selling titles Store Front-The Disappearing Face of New York, Miami Graffiti, Broken Windows and Burning New York, the exhibition will feature a selection of work from today’s top street artists. This groundbreaking exhibition, set to take place in a 4,000 square foot venue in the Midtown Arts District, will be the largest of its kind in Miami. The opening VIP preview will take place on Thursday, December 3, 2009 from 7 PM to 9 PM at 3252 NE 1st Ave, Suite 101, Miami, FL 33127. Exhibiting artists include: 131 Projects (Argentina), Aiko Nakagawa (Japan), Armogedon 2057 (Armenia), Billi Kid (Colombia), Crome (Miami), Cycle (NYC), Doze Green (NYC), Ewok One 5MH (NYC), Ghost aka Cousin Frank (NYC), Lady Pink (Ecuador), Nina (Brazil), Shiro (Japan), Sofia Maldonado (Puerto Rico), Suiko (Japan) and Vitché & Jana Joana (Brazil).